The most common question we receive about our stripline directional couplers, low loss airline directional couplers, and high directivity directional bridges is ‘How much power can it handle?’. The reason is that directional couplers are frequently used for load-pull testing of amplifiers or monitoring a signal after a power amplifier. In either case, the directional coupler will be placed as close to the output of the power amplifier as possible, which means it must perform within spec at high operating powers. 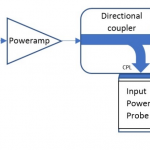 Despite the importance of directional coupler performance under high power inputs, most directional coupler vendors offer a single number without any background or context. As we will show in this post, the static value commonly provided for the power handling of a directional coupler is an oversimplification of the matter. In addition to catastrophic failures, which lead to permanent inoperability of the directional coupler, there are also soft failures. This is where the part temporarily falls out of spec under certain parameters of operation, such as the insertion loss increasing beyond acceptable limits under high power. Though less disastrous because a soft failure does not necessarily require replacement of the directional coupler, it is just as important to be aware of soft failure parameters to know when to question the results of a measurement. The most common soft failure in a directional coupler is when the temperature rises in the part and the materials inside expand at different rates. This causes a deviation of the geometry from the design and changes the performance of the directional coupler. This is different from the temperature cycling described in the paragraph about catastrophic failures because, as the part cools down, it returns to specification. –Stripline directional and dual directional couplers use a triplate stripline technique. They are available with all standard Marki connector options, and with flat coupling values and high directivity. The power handling of these directional couplers will be discussed and tested extensively later in this post. –Airline directional couplers use an air dielectric to minimize loss and maximize power handling. They are available in standard connector configurations as well as with N connectors. These also have excellent directivity, but the airline construction leads to a sloped coupling value characteristic of a single stage directional coupler. –High power stripline couplers are built with wide lines and thick dielectrics to minimize loss and offer high power handling, but with a flat coupling value. They are available with SMA or specialized APC-7 connectors to further minimize adapter loss with various test equipment. –High directivity bridge couplers are built as a resistive bridge with a balun. These offer extremely high directivity for return loss measurements, but they have very limited power handling due to the resistors absorbing half the power. Where does this energy come from? Dissipative loss in the striplines converts electrical power into heat. Therefore, the insertion loss (less the return loss) manifests itself as the heat generated by the device. 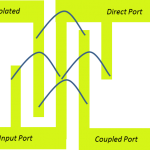 As input power increases, more power is dissipated in the lines of the directional coupler. This converted energy heats up the component using the lines almost like the filament in a lightbulb. 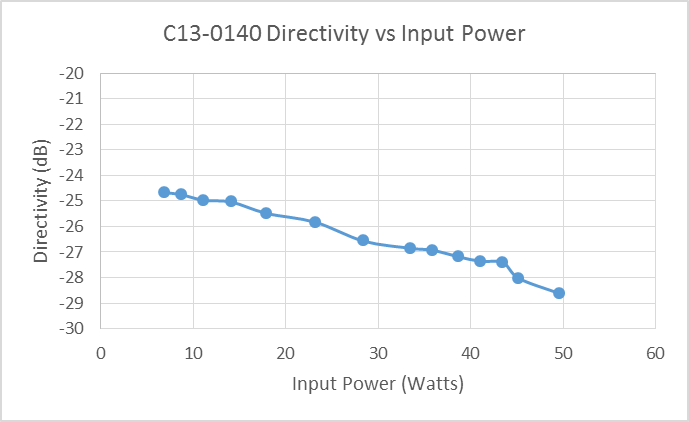 For example, putting +40 dBm (10W) into a directional coupler with a 1db insertion loss and no return loss means that 2W of power is being dissipated through the striplines. With this setup we can deliver a maximum power of 50 W into the test device. The power heads cannot handle such high power, so we heavily attenuate before measuring the output power. On the input side we used a CA-40 airline directional coupler as an input monitor and on the output side a CA-18 airline directional coupler as an attenuator. 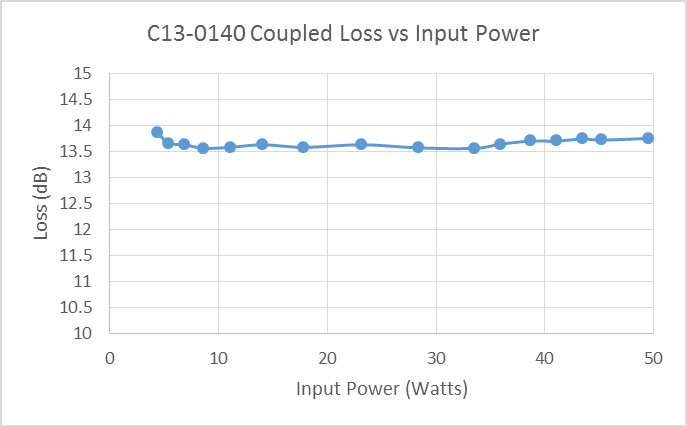 The temperature change of CA-18 is negligible during our tests and the CA-40’s air-line design means its insertion loss and coupling values do not vary over the temperatures we are testing the C13-0140. At 5.7GHz, the insertion loss and coupling value of the CA-40 are the same at room temperature and at 46 °C. This means that we can trust any changes in loss to be due to the DUT only and not the air line directional couplers. In the plots above you can also see the data fitting equations and their respective plot. We theorized that the mathematical form of the temperature settling would be . 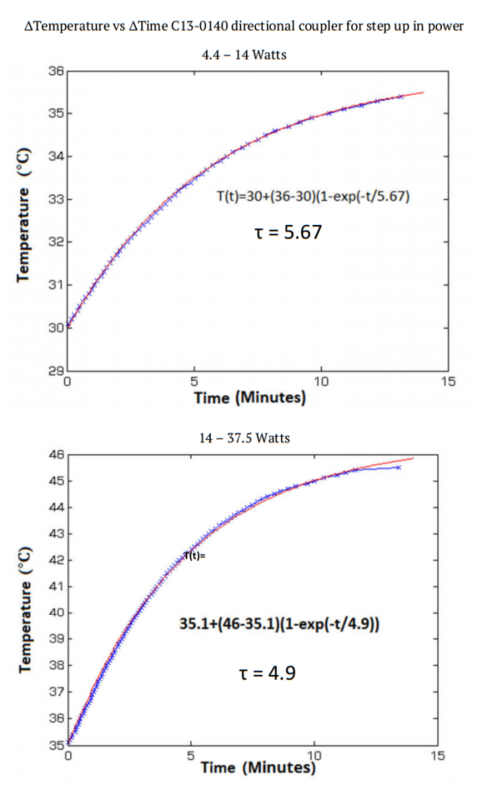 T0 represents the initial temperature and T1 represents the final settling temperature. τ is the time settling constant in minutes, which defines how long it takes the directional coupler to rise from T0 to T1. It takes longer for the temperature to settle for a jump from 4.4 to 14 watts than a jump from 14 to 37.5 watts. Though we can’t define a pure static τ, we can still see what order it is on, which is around 5 minutes. 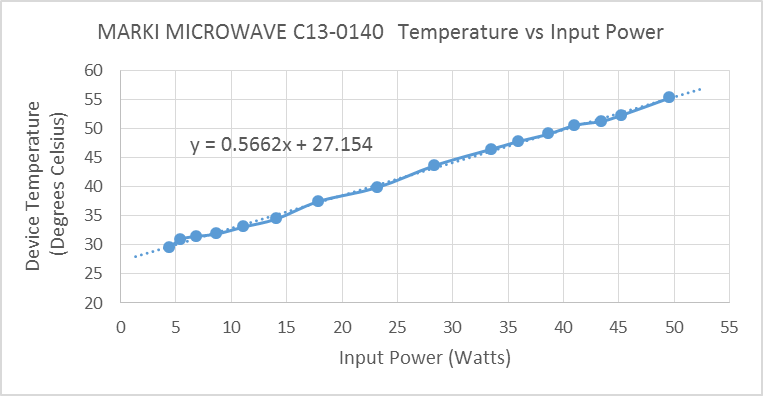 Since we have a general idea of the scales at which the transient temperature response matters we can now define when it is ok to use average power values to determine the maximum temperature of the directional coupler and when it would be necessary to do further calculations. If your pulse duration or random power fluctuations last for much less time than τ you can simply use average power to predict the maximum temperature, otherwise you cannot. 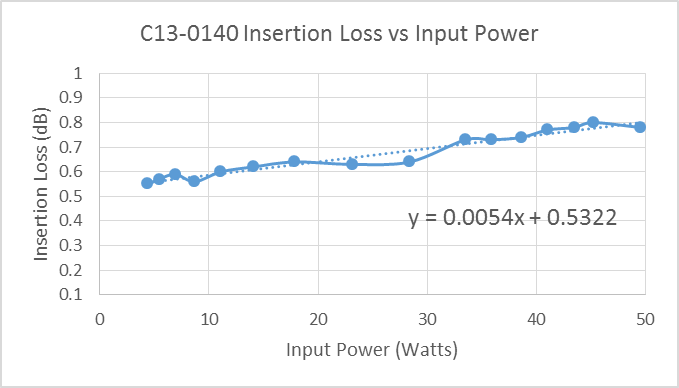 Insertion loss goes up as we increase the input power and with that, the temperature. This is exactly what we expected because increasing the temperature increases the resistance of the striplines. The coupled power shows minimal variation with a slight tendency to couple less power as temperature increases. Most surprisingly at 5.7 GHz, increasing input power improves the directivity. Directivity is the most sensitive spec to design parameters so small changes in the physical dimensions of the directional coupler can create drastic changes in directivityAt this frequency the directivity happens to increase with increasing power, most likely due to a shift to higher frequency as the coupler expands moving the directivity down the curve. 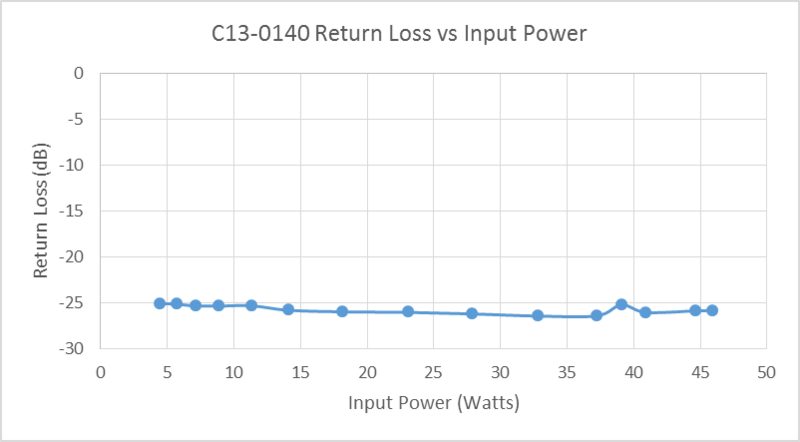 The return loss is constant against input power. All specs are still approximately the same after putting 50W of power into the part at 50 °C. 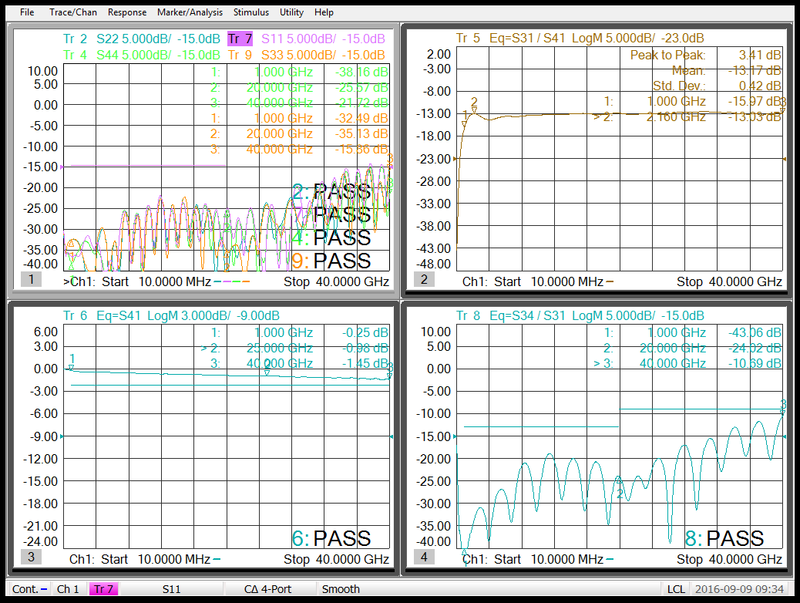 This demonstrates that operation of up to 50 watts of power at 5.7 GHz will not cause permanent variation of any of the directional coupler specs.